Firstly, do you know what Fulltone OCD version pedal paul uses? I'm looking to replace my Ibanez TS-9 not very impressed with it. Would this be a good decision or would i be better getting a keeley modded ts-9 over the FT OCD? 2. Full presence on the GH100L sounds horrible to me, sounds so tinny and fake, anyone else experiencing this? I find that the E34L has more gain than the EL34's JJ make, so i dont know where they get that 20% more headroom thing from. Theyre cool tubes though, cheap too. more gain and less headroom is the same thing. gain, and distortion, has to do with the tubes "clipping". the less headroom, the sooner the tubes create gain. Does anyone have paul's old quadraverb settings? Hey, those are my photos! Hey is that TC Electronics pedal new?? Thanks for taking the pictures! 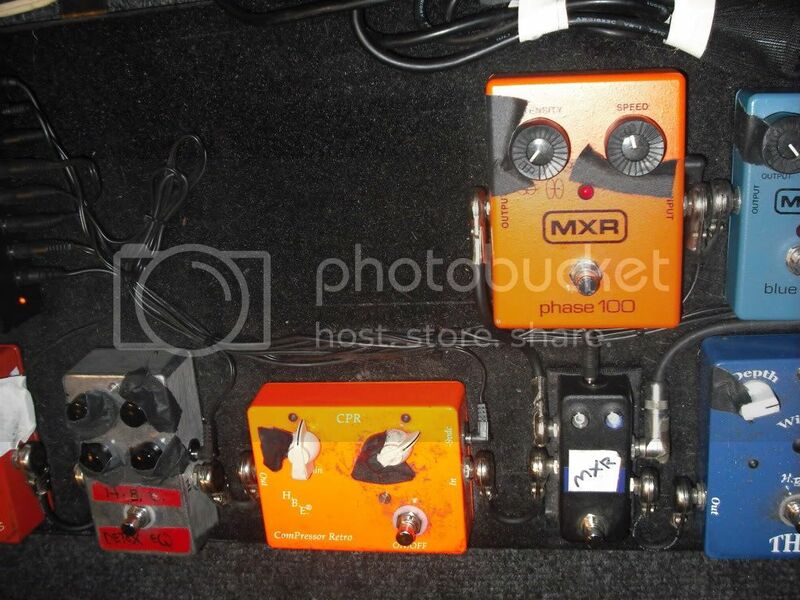 haha the red pedal next to the pedal power is a Bajo Mos pedal by Homebrew. 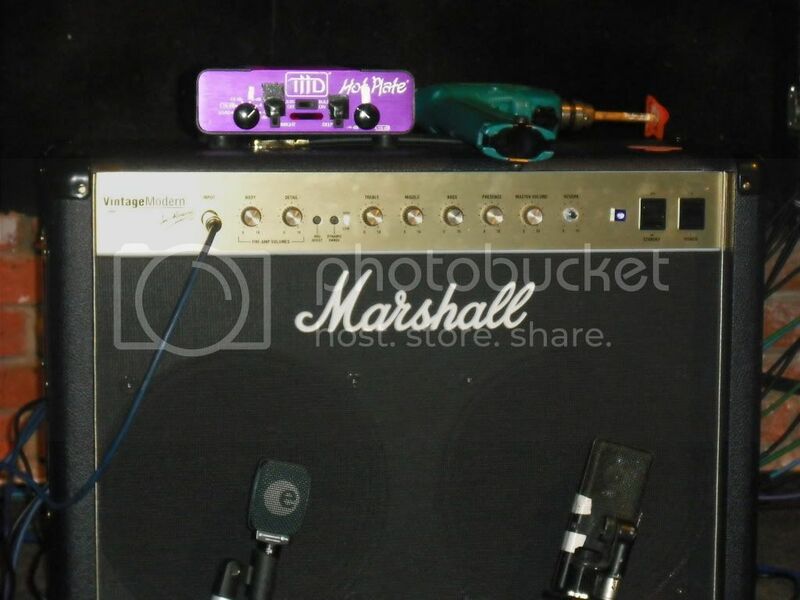 it is a bass preamp/booster.. wonder what he uses that for. Its probably used like most other boost pedals. Either to push the front end of the amp harder or add sustain and give a different tone for solos.
" The Detox EQ is a three band EQ built around the ultra quiet and warm Burr Brown IC. All three bands are very musical and useful with no harsh or missing frequencies. Master output Level control allows the user to set the Detox at unity, boost or cut. True bypass, 9 volt battery or DC adapter operation. List Price: $159.00 "
anyone knows how to build an eq like that? I rarely venture in to this corner of the board, because I usually have nothing compelling to add. 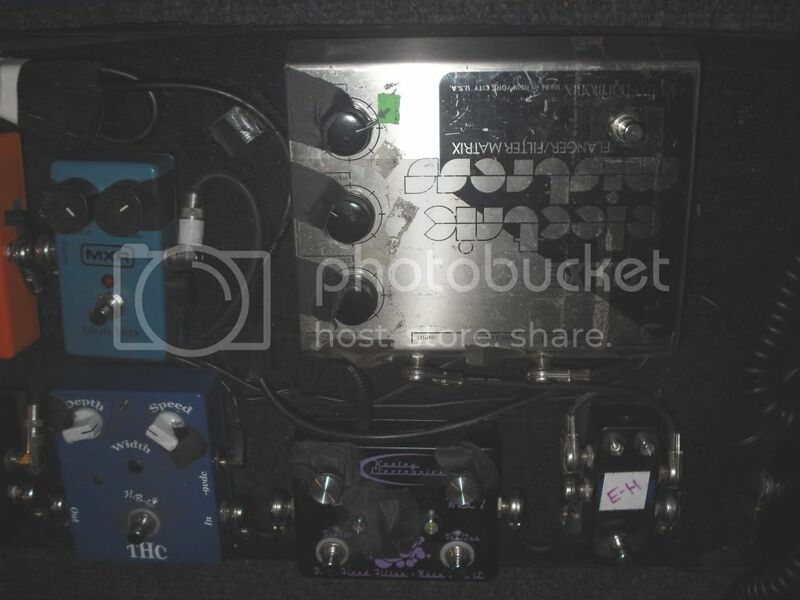 Today however I have a break-down of the entire pedalboard from 2008's tour, with exact model numbers and even links to the sites! It's in French though. GoogleTranslate will help you with that if you need it. donc en dessous du trasfo voodoo;"
- en bout de chaine un accordeur korg, quand au deux autres je presume que c'est des loopers. Yes, it's a Pitchblack tuner. 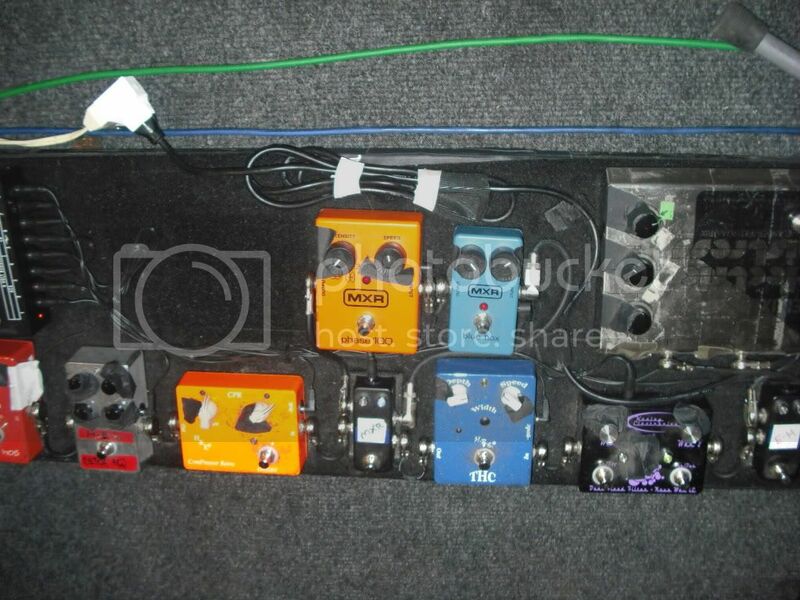 So there you have it folks... Paul's pedalboard from the tour. yes he does...he uses the prototype in the brushed metal casing. I posted these pics in another thread but thought they may be useful here. I took them last night at the Southampton gig. Whats interesting is the setting on Pauls VM, everything bar presence is set at one o clock, with the master on 8. This is somewhat different from previously posted settings. You can make out some of his pedal settings pretty well on the other pictures too. It zooms pretty well though so saving and viewing should be pretty legible.